Anyone running a minecraft server or play on one regularly? Interested in some casual minecraft play with some folks I know. Watched a live video stream of the developer playing the game for about half an hour. He was narrating what he was doing. Looked kinda neato. But there still isn't that much functionality for the price tag (15 Euros)... too steep for me. I dunno, seems like it almost has too much functionality. It's only a matter of time before someone builds SkyNet. Video is an oldie but a goodie. 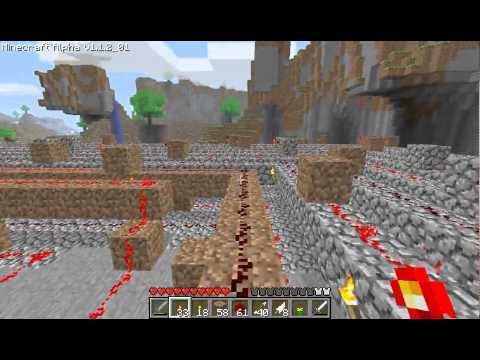 The "game" of minecraft is when you play in survival mode. You have to build a fort during the day to survive all the monsters at night. You can craft all kinds of tools and explore all sorts of different stuff. It is this exploring and crafting and building that is fun. All the pictures of people making computers and stuff is done in like "wizard" or "god" mode where you can just create blocks willy nilly without having to do any mining/exploring/crafting. So is it cooperative fort building, or competitive? Can I build a trebuchet to knock down your walls and send all the monsters your way, thus saving my own hide? Not that *I* would ever do such a hideous thing. No, not poor lil old me. There's nothing to stop you from tearing everything down. ; ) That's why a lot of people don't play on public servers. Re: monsters, from watching the dev play it, it doesn't seem like a challenge. They couldn't smash through his wooden house with glass windows. It's not much of a challenge, more of a nuisance. The game is really about exploring and building. But... exploring and building what? Personally, I haven't seen anything worth exploring or building (in the sense that it's fun). At least in its current form.